Believe is a verb. A verb is an action. Therefore, to believe is to ACT. For years, I've protested starting anything Christmas related until after Thanksgiving. No tree, no visits to Santa, no Christmas music. Let Thanksgiving have its due! This year, however, I realized something that changed my outlook and may alter how we celebrate the holiday season in the upcoming years. 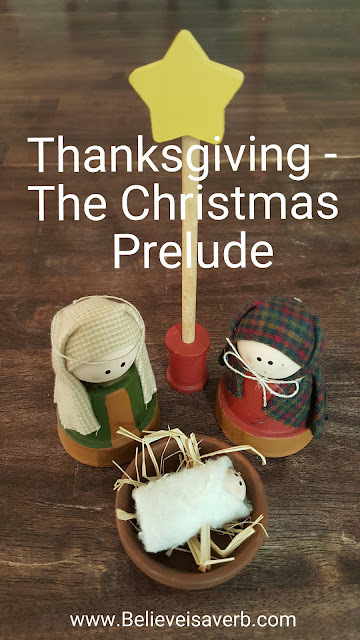 Thanksgiving and the reason behind it is the perfect prelude to Christmas. How better to celebrate the birth of our Savior than to express gratitude for all He has given us? We live in a time when letters to Santa outnumber act of service, retailers open earlier and close later to accommodate holiday shoppers, and people brawl to get this year's hottest items. "I want" and "Give me" are shouted while "Thank you" is murmured or not spoken at all. This year, instead of focusing on the presents and decorations, let's start celebrating with an attitude of gratitude. Let's be grateful for what we have; focus on what's in front of us rather than what's on the store shelf. Give rather than receive. Share of our abundance. Praise the Lord for giving us the ultimate gift - the gift of eternal life. Thank our Heavenly Father for sending His Only Begotten Son to save us from our sins. Give thanks for that glorious morn when Christ was born to a young virgin in the city of Bethlehem. For without that first Christmas, there would be very little to be grateful for indeed.